As it is known, according to the principle of reflection of palatalized velars or in the form of affricates and fricatives, either in the form of pure velars, all Indo-European languages are divided into two groups Satem and Centum. 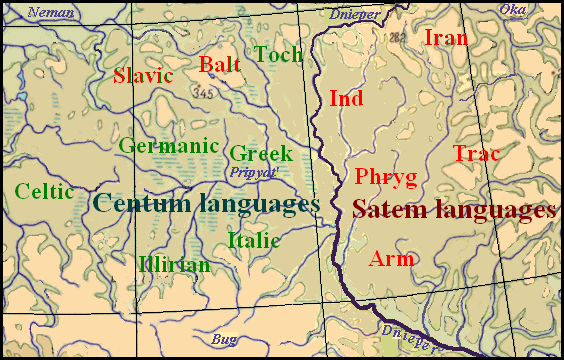 The Satem group includes the Indo-Aryan (Indic), Iranian, Baltic, Slavic, Albanian, Armenian, Phrygian, Thracian languages. The Hittite-Luwian (Anatolian), Greek (Hellenic), Italic, Germanic, Celtic, Tocharian, Illyrian languages belong to the Centum group (POKORNY JULIUS. 1954: 376). However, there is little disagreement about this division, G. Province, for example, refers to a group of Phrygian language "centum", although it is questionable (KRAHE HANS, 1966: 30). Currently, the same view adheres to F. Kortlandt (KORTLANDT FREDERIK. 2016). Proto-Albanian belonged to the Satem group languages, preserved the row of palatal guttural consonants and carried out their assibilation. However satemization was "inconsistent" in this language like as in the Baltic languages (less for Slavic ones). This "inconsistency" can be considered as a feature of fairly wide transition band in the central part of the Indo-European space, which could consist apart from the Baltic and Proto-Balkanic also of the Illyrian (with Messapian) and Thracian languages. The tendency to assibilation of palatal consonants was powerful innovation of the period prior to rupture of the territorial contacts between different parts of the Indo-European community. This innovation weakened moving from east to the central zone, meeting with the approaching from the west the tendency of the neutralization of the opposition of palatals and velars. (DESNITSKAYA A.V. 1966: 11-12). The whole dialect space, which Proto-Albanian belonged, according the feature of the setting of the Proto-Indo-European scheme of three short vowels *e, *o, *a to the schema of two vowels *e, *a (in Slavic *o) opposed to the vast area in southwest and south of the Indo-European space (Celtic, Italic, Greek, Phrygian, and Armenian), where the three-part scheme was preserved, and Indo-Iranian region where three-term model was reduced to a one-term one *o (DESNITSKAYA A.V.1966: 10). That is, three areas existed: the area A, which has kept all three of the ancient Indo-European short vowels, the area B included the Proto-Albanian, that is Thracian, language and characterized by displaying them in two vowels, and the area C where they were reflected to one vowel. The second fact is very important also for determination of the order of migration of speaker of particular Indo-European languages from their Urheimat. However we need to do some clarification here. There were in PIE language not three but four rows of stops – the voiced aspirated, voiced plain, unvoiced aspirated, and unvoiced plain ones. However unvoiced aspirated stops were very rare, so Desnitsky said only about the three series, although included in consideration also unvoiced aspirated stops in a later paper (DESNITSKAYA A.V.1968). But the most important is the unity of voiced aspirated and voiced plain stops in one row of voiced plain stops in the Celtic, Germanic, Slavic, Baltic, Iranian, Armenian, Thracian, Albanian, and Illyrian languages, i.e. voiced aspirated stops did not survive in these languages. Voiced aspirated stops were preserved in Greek, Italic, Indo-Aryan (one can not say sure about Tocharian), another thing is that they reflected in each language in different ways later. It implies of this that the ancestors of Italics, Greeks, and Indo-Aryans would have been among the first to leave their Urheimat and so saved the old Indo-European sound composition. Having lost contact with each other and got into the neighbourhood with native speakers of another sound structure, they could fall under the different language influences and therefore, e.g., Greek voiced aspirated bh, dh, gh transformed in φ, θ, χ, and Latin bh, gh did in the f, h accordingly. Unvoiced aspirated ph and th reflected in Greek to φ and θ but coincided with p і t In Latin. The languages of other Indo-European peoples, who remained on their previous places, were developed by more or less common phonetic laws, and so all they have lost aspirate bh, dh, gh, ph, th, kh (including the Germanic languages, although there we have Sound Shift). The archaeological cultures of the last quarter of the 3rd mill. BC in Asia Minor came the really dramatic changes. These changes suggest the emergence of new ethnic elements that can be identified with the ancient Anatolians – but rather about their appearance from the west than from the east. (DIAKONOV I.M. 1968: 26-27). The outpouring of the relation of Albanian with the North-Indo-European languages (Baltic, Slavic, Germanic) give reason for searching For-Balkan homeland of the group of Indo-European tribes to which belonged also the ancestors of the Albanians, somewhere in the neighbourhood of the settlement space of the North-Indo-European tribes (DESNITSKAYA A.V. 1984: 220). We can also assume that the Phrygians and Proto-Armenians went by this way before, departing later somewhere near southward because they still stayed in the space of Indo-European linguistic influences. Obviously, these effects were smaller than on Albanian, as Armenian remained as well as Satem language. At the same time, with such an assumption, the Phrygian centumism should be considered problematic. The Thracians settled in the triangle between the Teterev, Ros, and Dnieper rivers. As a result the satemization of Thracian was stopped because the powerful Dnieper border prevented contacts of the Albanian speakers with the Iranian tribe speaking languages of the Satem group. Thus Western influences took over in the Thracian language. In contrast, the Balts and Slavs moving eastward after the departure of Tocharian ancestors came into direct contact with Iranian speakers and later with the Finno-Ugrians therefore palatalized velar k', g' of their language transformed in front sibilants. That is, these languages, primarily belonging to the Centum group, came under the process of satemization later than others Satem languages. V. Abayev thought so, referring to V. Georgiev, who suggested that the assibilation of palatals occurred in Indo-Iranian language no later than the 3rd mill BC, while this process occurred in Slavic "in an era not so distant from the before written records (ABAYEV V.I. 1965: 141). Obviously, the satemization of the Slavic languages occurred even later than in the Baltic when settling the territory of the Balts under the influence of the local substrate. According to the lexical and statistical data on which the model of the Indo-European languages ​​was built, the Albanian language has the greatest number of common words (excluding the common Indo-European lexical fund) with Greek. On their ancestral homeland, the Proto-Albanians did not have direct contacts with the Greeks; therefore, the total number of Albanian-Greek correspondences included Greek borrowing in Albanian from Greek already during the time of the Thracians in the Balkans. If we exclude these borrowings, it turns out that Albanian has the most lexical correspondences with Germanic languages. The Thracians also did not have contacts with the Germanic tribes during the formation of their language, but having crossed the Dnieper, they found themselves very close to the habitats of the settlements of the Proto-Germans (see the section Germanic Tribes in the Eastern Europe at the Bronze Age). This neighborhood has identified Germanic-Albanian connections that are found in the phonetics, vocabulary and grammar of the Albanian language. 1. Alb. barrё (IE *bhorna) «burden» — Goth., O.H.G, O.Icl. barn «child». 2. Alb. Gheg. bri (stem brin-) «horn» (IE. *bhr-no-) — Sw. dial. brind(e) (*bhrento), Norw. bringe «elk». Also cf. Let. briedis, Lith. briedis «elk». 3. Alb. bun "shepherd's hut in the mountains", originally "housing", buj/bunj “sleep” out of IE *bheu, *bhu-. Close by meaning: Goth. bauan, O.Icl. būа, O.H.G., O.Saxbūаn "live, dwell, cultivate (land)"; O.Icl. būа, O.Eng bū "housing". 4. Alb.dhi, «goat» (Proto-Alb. *diga) — O.H.G ziga, IE *digh "goat". 5. Alb. gjalm, gjalmё «lace, string» — O.H.G sell, O.Saxsel, O.Eng. sal «rope», Goth insailjan «to rope». 6. Alb kale «fish bone, awn of the ear» (IE. *skel- «cut») — Goth. skalja «shingles», O.Icl. skel «flake», O.H.G scāla "a shell of the grass." Formations from this root are also represented in other Indo-European languages. But only in the Albanian and Germanic have a special similarity in the structure of the stem and in the meaning. 7. Alb helm "poison, sadness, grief" — O.H.G. scalmo «plague», skelmo «criminal». Out of IE. *skel «cut». 8. Alb. hedh «throw out» — O.Sax. skiotan, O.H.G. skiogan, O.Eng. sceotan «throw, shoot». 9. Alb. Gheg. lâ, Tosk. le (*lədnō) «leave», participle lane (*lədno-) «left» — Goth., O.Eng. lētan, O.Sax. lātan, O.Icl. lāta «leave»; adjective Goth lats, O.Icl. latr «sluggish, lazy». 10. Alb. (i)lehtё «light» (IE. *legik-, *length-) — Goth. leihts, O.H.G, līhti), O.Eng leaht «light». Adjectives with a similar meaning, derived from the same root, are represented in a number of Indo-European languages, but only in Germanic and Albanese the stem of the adjective has the suffix -t-. 11. Alb. lesh «wool, fleece» — Dt. vlies, M.H.G. vlius, O.Eng fleos «sheep skin, fleece». IE *pleus- «pluck wool, feathers». 12. Alb miell, «meal» — O.H.G. melo, melaues, O.Eng. melu"meal". This is a case of complete identity in the structure of the stem and meaning. 13. Alb. mund 1) "be able, to be able to" 2) "to win, to overcome" mund "effort, hard work." These words, which in Albanska give a variety of derived formations, are usually associated with O.H.G. muntar "cheerful, alive", munt(a)rī «zeal, diligence», Goth mundrei «goal» and are assotiated with IE. *mendh "to direct thoughts, to be alive." The above Albanian words that convey the meaning of “physical strength, physical effort, victory in a fight” clearly stand out among the tribes of Indo-European formations associated with the root *men-. The development of both Germanic and Albanian meanings is well explained from the primary meaning “hand” (Gmc. mundō "arm, protection", Albanian verb mund "to be able to win" is an ancient derivative). 14. Alb. Gheg rū, rūni, Tosk. rёndёs «abomasum» — M.H.Grenne «abomasum». 15. Alb rē «cloud» – O.H.G. rouh, O.Saxrōк, O.Icl. reykr «smoke», Gmc. *гauki. 16. Alb. shparr (*sparno-) — a kind of oak (Quercus conferta) — O.H.G., O.Sax, sparro, M.H.G. sparre «log, beam, rafter», O.Icl. spari, sparri «log, beam» (common Gmc. *spar(r)an), O.H.G. sper, O.Eng. spere, O.Icl. sparr «a spear». 17. Alb. shpreh «speak, express» (*spreg-sk-) – O.H.G. sprehhan, O.Sax., OE. sprēcan «speak». 18. Alb lapё, lapēr "hanging, flabby piece of skin; belt, inedible piece of meat; skin hanging on the neck of an ox; flap" — O.H.G. lappo, lappa «hanging piece of leather, fabric», O.Sax., lapp «skirt, flap of klothing», Ger. Lappen «flap». 20. Alb. flater, fletё, -a «wing», flatroj «flit», flutur «butterfly», fluturoj, fluroj «fly, flit». Cf. Ger. flattern «flit», Eng. flutter, flitter "flit, flutter their wings". There are options with voiced intervocalblastic: Erly Ger. vladern, cf. Fledermaus (Eng. flittermouse) "microbat". Expressive onomatopoeia, violating the laws of sound correspondences, led to the creation of strikingly similar lexical units in the now territorially distant from each other, but had been contacting at some time (in the prehistoric era), the Germanic and Albanian languages . The corresponding formations are widespread in both the Germanic and Albanian dialects, which indicates their antiquity. The study of Baltic place names outside ethnic territories gave grounds for hypothesizing the migration of a part of the Balts to the Balkans supposedly in I millennium BC. Examples of toponymic correspondences on the territory of Romania, where the Proto-Albanians could be, are given below. Balta Albă, a commune and village in the county (județ) Buzău – the most convincing Baltic toponym in Romania, since the double name consists of the Baltic and Romanian words having the same meaning "white" (Lith. baltas, Let. balts, Rom. alb). What was the original name, remains to be seen. Suveica, a village in Mureş County – the village of Suviekas in Zarasai District, Lithuania. Cf. Lith. suvaikyti "drive together, round up". Țuțora, a village in the județ Jassy – good compliance with the name can be seen in the Baltic place-names: Lake Čičirys in the northeast of Lithuania, near the village of Suviekas in the Zarasai district, the Ciecere River, rt of the Venta River in Latvia. In Ukraine, there is a village Tsitori (Ternopil Region in Ukraine). Vârleni, a village in the județ Vâlcea – Lith. varlė "frog". The Bulgarian scientist Duridanov Ivan, having studied the Thracian-Baltic and Dacian-Baltic language connections, found 60 convincing separate lexical correspondences between the Dacian and the Baltic languages and 16 more possible, and between Thracian and Baltic – 52 and 19 respectively. At the same time, there were only 14 common Thracian-Dacian-Baltic correspondences. (DURIDANOW IWAN. 1968: 100). These numbers may seem small, but it should be borne in mind that the vocabulary of the Thracian and Dacian languages has been preserved in very small quantity, so it is not the absolute numbers that are important, but their comparison with the data on the connections of the Thracian and Dacian languages to those close to the Baltic. First of all, we mean the Slavic languages, but no special Dacian-Slavic or Thracian-Slavic ties were found ibid. The data of Duridanov are confirmed by Proto-Albanian and Pro-Baltic connections. Especially impressive, according to Desnitskaya, are lexical correspondences that stand out for their specificity. Alb. i thjermё «grey» (< Proto-Alb. *sirmnas) – Lithsirmas, siřvas «greyй» (DESNITSKAYA A.V. 1990: 10). Продолжительные миграции фракийцев со своей прародины к адриатическому побережью и их длительное пребывание в зоне контактов с носителями языков разных групп имели следствием редкие типологические черты албанской грамматики. Как утверждает А.Ю. Русаков, албанский язык обладает восьмью-девятью из двенадцати признаков ареала SAE (Standard Average European) и, кроме того, характеризуется также определенными типологическими схождениями с иранскими, балтийскими и тюркскими языками. (Русаков А.Ю. 2004, 259-274). Все это затрудняло установление генетических связей албанского языка с другими индоевропейскими. Now we can find explanation for the fact why the Albanian language has so many common words with the Germanic and Baltic languages (see data on the number of common words in the Albanian and other Indo-European languages above) in the assumption that ancient speakers of Proto-Albanian language settled in close proximity to the settlements of the Germanic and Baltic tribes. Such complex migration route of the Proto-Albanians and their long stay in the zone of contact with speakers of different language groups explains the rare typological features of the Albanian grammar. According to A. Rusakov, Albanian language has eight or nine of the twelve features of the space SAE (Standard Average European) and, in addition, is also characterized by certain typological correspondences with the Iranian, Baltic, and Turkic languages. (RUSAKOV A., 2004, 259-274). It will be shown further where and when the Proto-Albanians (Thracians) had contacts to explain to a certain extent, these correspondences. Now, knowing the origin of the Albanian language from Thracian, we can find an explanation for the fact that Albanian has so many common words in German and Baltic languages (see Data on the number of common words in Albanian with other Indo-European languages above) – Thracians have long been in close proximity to the settlements of the Proto-Germanic and Proro-Baltic peoplea. Their difficult migration path and long stay in the area of contact with native speakers of other groups explain the rare typological features of Albanian grammar.